The rebalance sequence is always best in my own sacred space! It’s great to be home. Being part of this self care movement with a family of inspiring practitioners truly empowers my being and the space I hold as a teacher! I’m forever grateful for being a student first and foremost! I chose to take this shot with the light in the background but had no idea it would look like an orb of energy radiating from my center. 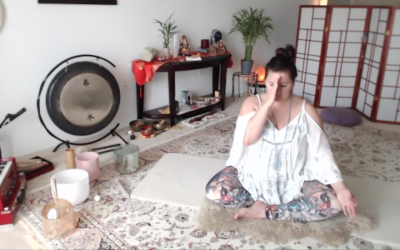 I’ve learned the most about chakras from Caroline Myss. She talks about our creativity being downloaded into the 7th chakra when we have an inspiration, it moves to our 6th when we begin to “mull” it over, it travels to our 5th when we are able to articulate it in words and sentences, our 4th when we feel as though we could really get behind it and support it, and here is where it gets interesting. The lower three chakras are about birthing what is inside of us into the outside world through action and sharing. She describes it much more brilliantly than I ever could, but this picture made me think of my finding my way and my voice in this world of healing self care. It is an amazing and vulnerable journey but I couldn’t imagine anything else! 💜💜💜 Well, that turned out to be longer than anticipated, so with all that, may you find your inspiration and creativity moving through your system and finding its roots into your life!